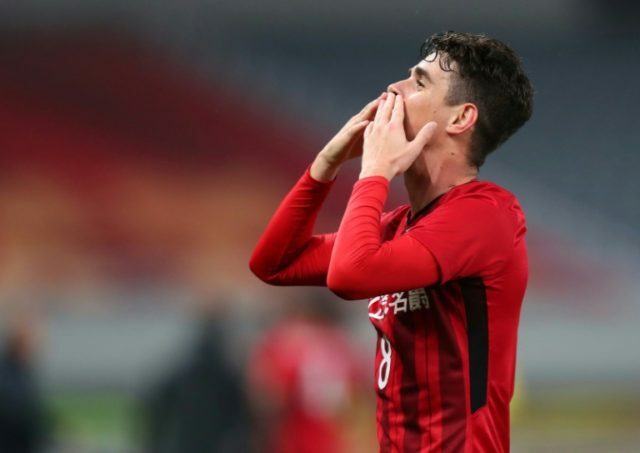 Shanghai (AFP) – Brazil’s Oscar came riding to the rescue on Wednesday as he twice grabbed quickfire equalisers to force a 2-2 draw for Shanghai SIPG against Ulsan Hyundai in the AFC Champions League. Asia’s record signing found his magic touch when it mattered with a goal in each half to preserve Vitor Pereira’s unbeaten start as coach after taking over from Andre Villas-Boas. Oscar had buried a hat-trick at the weekend as SIPG opened their Chinese Super League campaign with a record 8-0 thrashing of Dalian Yifang. And after Ulsan twice took unexpected leads, he quickly hit back with first a low shot and then a curler into the top corner to keep SIPG top of Group F with seven points from three games. The ex-Chelsea man started with intent when he rattled the bar with a dipping shot on 21 minutes. Wu Lei also came close with a glorious volley on the turn as the home side threatened to run riot. But Ulsan’s Austrian defender Richard Windbichler headed the opener on 37 minutes when he met a corner at the near post and flicked it into the far corner. Ulsan’s lead lasted only seconds, however, before Oscar rifled his shot past goalkeeper Oh Seung-hoon to make it 1-1 in the very next minute. After the break, Wu crashed another effort against the crossbar but again it was Ulsan who went ahead when Lee Myung-jae’s low cross was buried by Kim In-sung on 68 minutes. However, Oscar found another reply just two minutes later when he sumptuously bent his second equaliser of the night past Oh to restore parity with 20 minutes left. Earlier, goals from Shoma Doi and Naomichi Ueda doomed Sydney FC to their second defeat in three games as the hosts crashed 2-0 to Japan’s Kashima Antlers. Australian media said tempers boiled over in the tunnel at half-time as Graham Arnold’s A-League leaders were left winless after three games and stuck at the bottom of Group H.
Also in Group H, Shanghai Shenhua had Giovanni Moreno’s 71st-minute spot-kick to thank as they held Suwon Samsung Bluewings 1-1. And in Group F, Leroy George’s injury-time penalty rescued a 2-2 draw for Melbourne Victory against Kawasaki Frontale.